Participatory approaches in local policy are evergreen prescriptions, undisputed receipts for any intervention aimed at spatial development, social cohesion and cultural empowerment. Creativity is the natural seasoning of initiatives aimed at social and spatial development in distressed territories. Artists and designers seek the complicity of citizens and local communities to legitimate their production. In return, their language and skills may empower communication and organisation capacity of local communities. They can support reflexive capacity and give voice to local struggles, or engender in the most successful cases solidarity. There is a rich body of literature addressing innovation at the micro-level, but the local scale alone cannot be where all problems are created, understood and solved. While the localist discourse is often used to veil receding public support and let local communities compete alone for survival and resilience, creativity that fosters social innovation finds itself distorted into palliatives, if not mere cosmetic practices. The purpose to produce benefits for local communities and dispossessed subjects may easily turn into producing visibility for the creative players themselves. Artists and social workers who mediate co-productive processes end up, consciously or not, serving vested interests. Green-washing, art-washing and gentrification are some of the words employed to spell out the cooptation of creative forces by dominant players and economic forces. This conference is an exercise to look at practices and reflections which may shed light on this context, helping to discern, understand and critically study community-based co-production and co-creation. It looks at a number of fields related to activism in housing, public space development, employment, migration, energy efficiency, climate change, food and waste management, urban poverty etc. 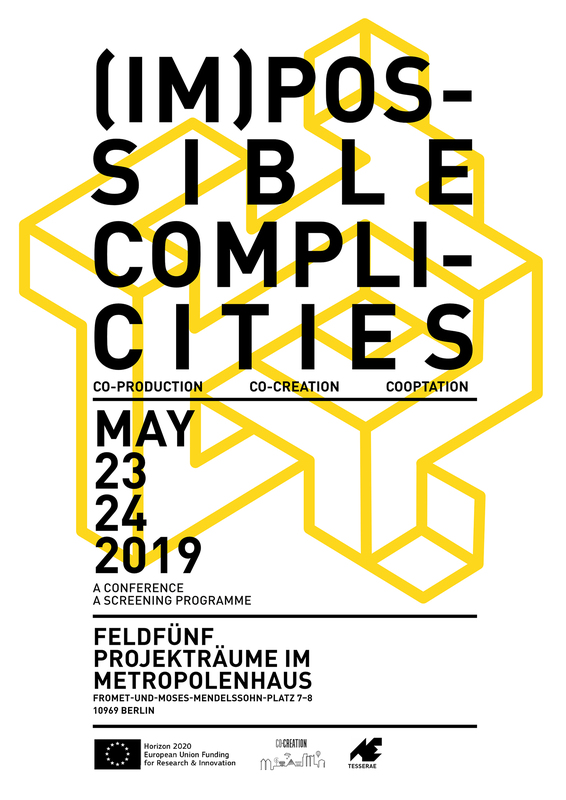 (Im)possible Complicities conference looks for ideas that come from practice and concrete engagement in distressed territorial contexts. We want to discuss the potential and pitfalls of co-creative projects with activists, artists and academics who share a constructive as much as critical view on the topic. The conference is part of the CoCreation– EU Marie Curie Rise project involving academic and non-academic partners from Europe and Latin America. The conference will have a practice-oriented multidisciplinary approach. We encourage non strictly academic formats and interactive presentations.